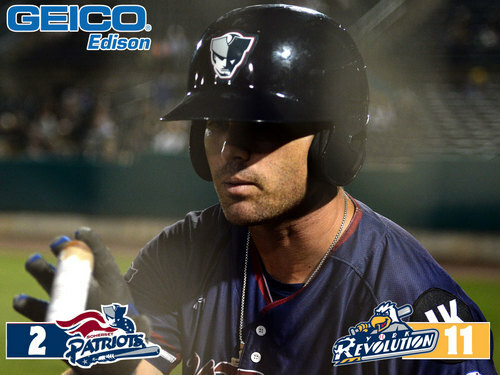 York, PA- The Somerset Patriots (37-25, 72-53) were bested by the York Revolution (35-27, 67-58) by a score of 11-2 in the penultimate game of the regular season at PeoplesBank Park on Saturday night. The Patriots scored in the very first inning of the game, when Jayce Boyd laced an opposite field double to score Alfredo Rodriguez to make it 1-0. However, after that point, it was all York. The Revolution responded immediately, as Isaias Tejeda recorded a two-run double, before Wellington Dotel drove in another run with a single to make it 3-1. All three runs came with two outs. York would go on to score six more unanswered runs. A Henry Castillo RBI single made it 4-1 in the bottom of the third. Then, York exploded for five runs on six hits in the fourth inning to make it 9-1. The Patriots grabbed one back in the top of the fifth, when John Nester singled and eventually scored on a wild pitch. But, that was the last offense Somerset would generate. York added insurance in the bottom of the fifth, and again in the bottom of the eighth. The Revs’ bullpen kept the Patriots off the scoreboard for the final four innings of the game to secure the win. Austin Wright (1-0) gutted his way to his first win with the Revolution. He pitched six innings and allowed two runs on eight hits and one walk with seven strikeouts. David Kubiak (8-3) made his return to the Patriots on Saturday night, but took the loss after giving up nine runs in 3.1 innings.